In an earlier post I wrote about my color perception deficiency, a fairly common mild form of red-green color blindness. Traipsing around the garden, camera in hand, it dawned on me that much of the fall color on display involved interplay between green and red. 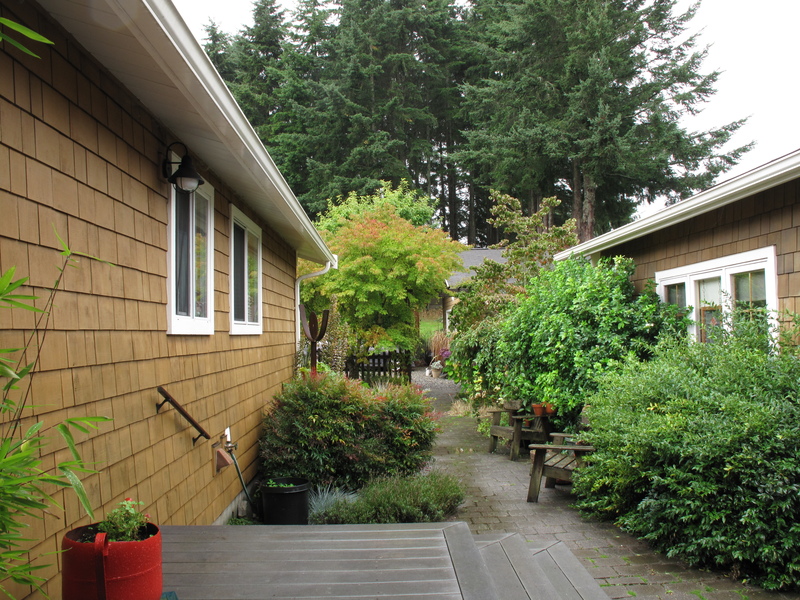 The above view from our front door, which opens on to the courtyard, is typical of the Pacific Northwest. 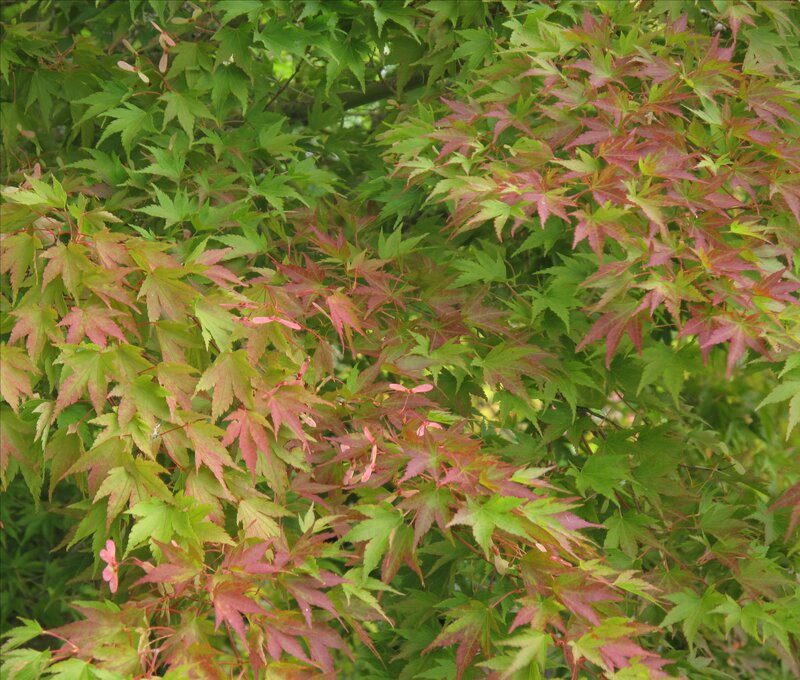 The Maple and Dogwood in the courtyard entrance are just now coloring up. The Douglas Fir in the distance provide a backdrop and privacy from the nearest road. Moving in for a closer look (required for me to notice the reddening leaves) yielded this tighter shot of the maple leaves. 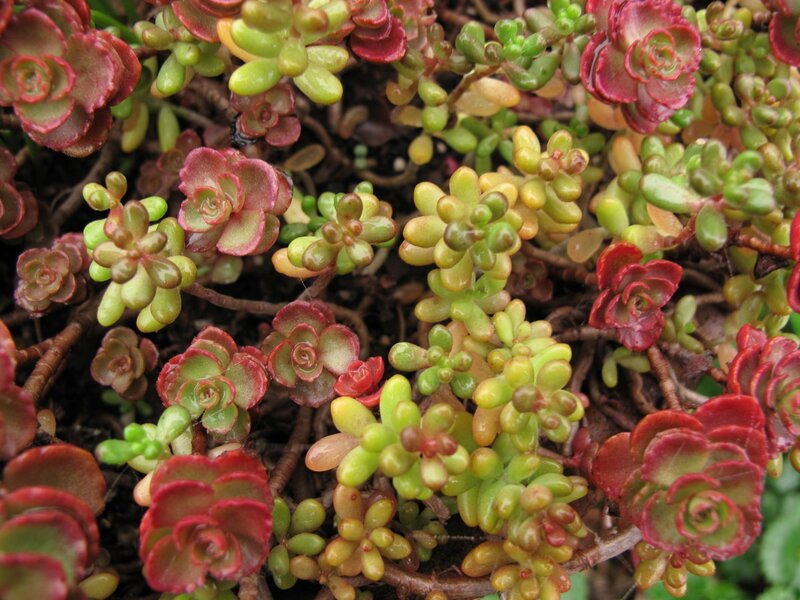 This close up of a pot of Sedums is intense, even to my questionable eye. Well, maybe not all the fall color is red and green. Here’s Fletcher contrasting nicely with the waning Rudbeckia blooms. No red color for the reliably evergreen and winter blooming Sarcacooca ruscifolia. But later this winter its tiny white flowers will perfume the air around the entrance to our small detatched “west wing.” The Sarcocooca blooms are followed by red berries that ripen to black. The west wing, a former garage, and the rest of the courtyard is densely planted with Mexican Orange (Choysia ternata), Nandina, Lavender, Columbines, Euphorbia, a small weeping Cherry, and the Sarcacooca ruscifolia. The Sarcocooca’s lateral, tassle-like buds (also called axillary buds) cover the plant right now and will open sometime later this winter. In colder climates bloom is expected in Spring. 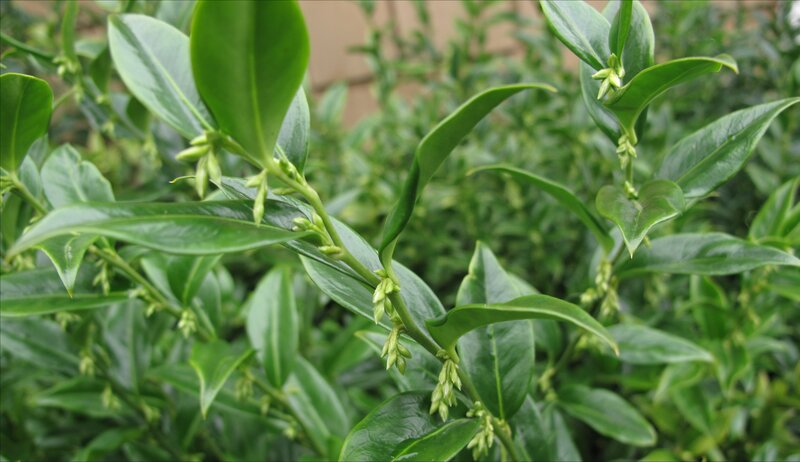 The glossy evergreen leaves are tough and will thrive in shade or part shade, but the plant is usually listed as hardy only to USDA Zone 7. 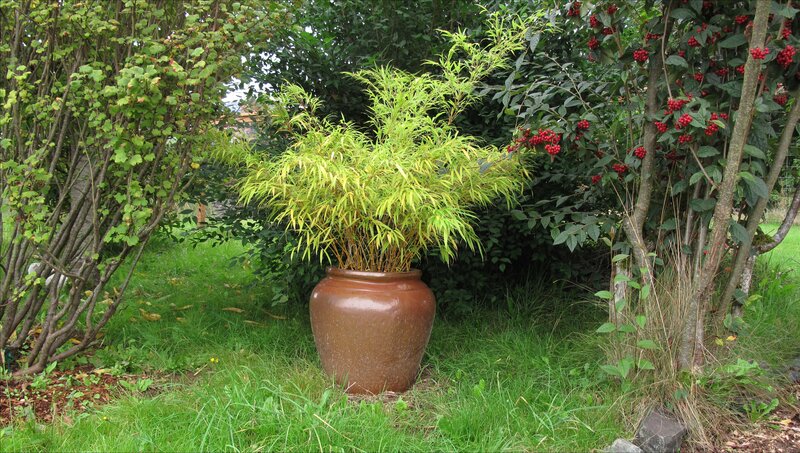 I’ve always fancied a shapely bamboo in a pot somewhere in the landscape. Sadly, I never considered what I would do after the bamboo became pot bound. Now I wonder how I’ll ever get the bamboo out without destroying the pot! 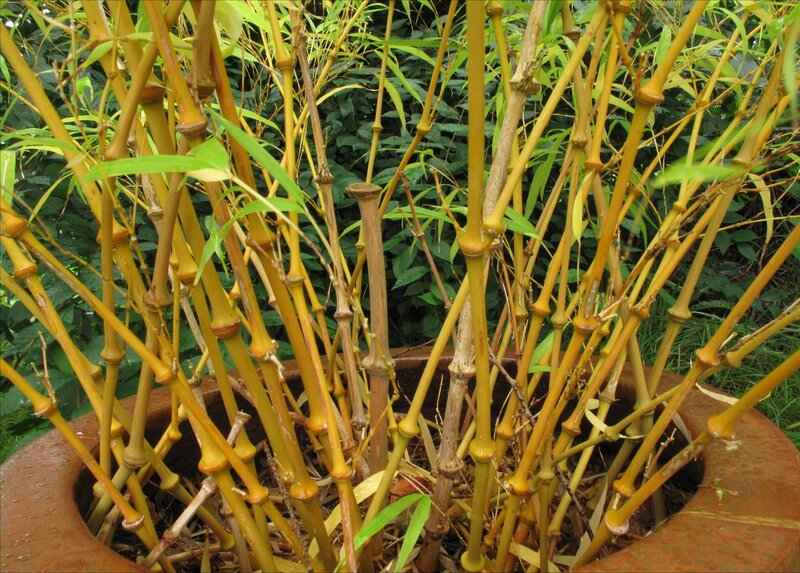 Lesson learned: Never plant a bamboo in a pot where the opening’s diameter is narrower than the middle of the pot. On the plus side, those in the know warn that this bamboo Qiongzhuea tumidissinoda, though slow to establish, will eventually become an aggressive spreader. So for now I don’t have that problem, though I suppose it will eventually burst this pot. Anyone have suggestions how to extricate the plant and preserve the pot? This bamboo, besides the pleasing delicate leaves cascading into a fountain like shape, is culturally important to the province of Szechuan, where for centuries it was made into beautiful canes. 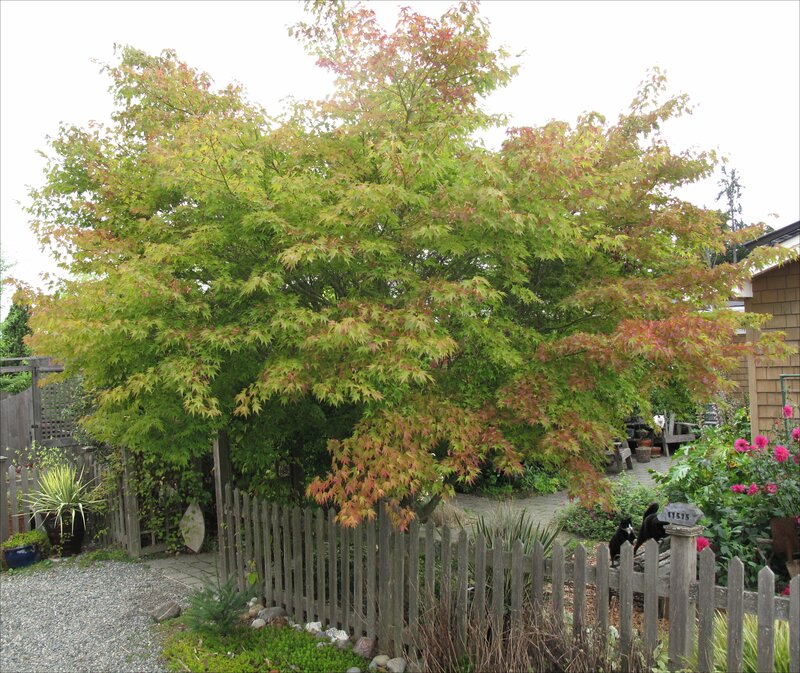 Finally, for fall color contrast I vote for the Cotoneaster rehderi. 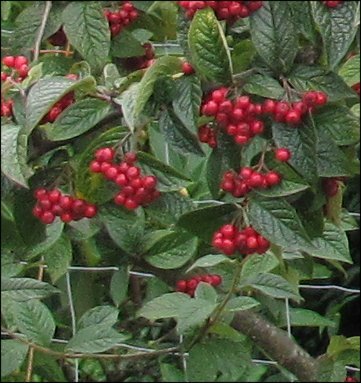 Despite my red-green color challenged perception issues, the deep red berries pop against a background of green, veined leaves. 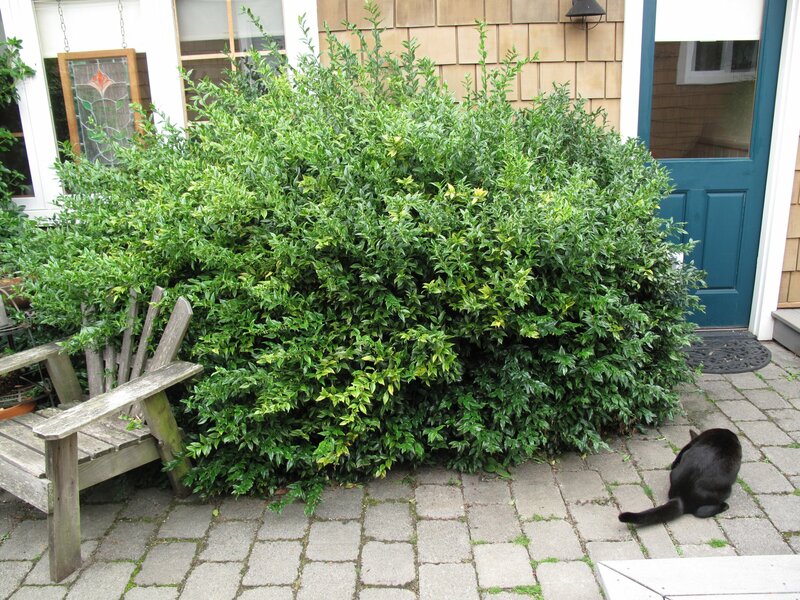 This entry was posted in Plant Picks and tagged Chinese Walking Stick Bamboo, Cotoneaster lacteus, Fragrent Sweet Box, Qiongzhuea tumidissinoda, Sarcococca ruscifolia by Bart Arenson. Bookmark the permalink. 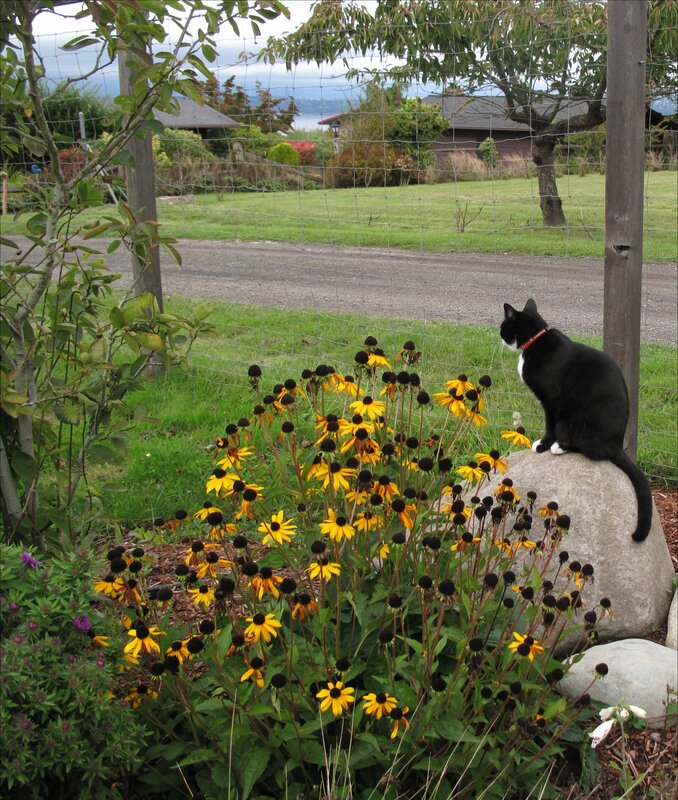 The cat and the Rudbeckia are a nice combo. How do you get her to stay there? Good question. Fletcher is always on the move. Just luck this time to catch him in the Rain Garden. If I’m out working in the garden its more an incentive for him to hang around. We have another bed anchored by an old apple tree that we’re calling the Cat Garden, which Fletcher will also frequent. But being a young fellow, he likes to roam a bit too much for our taste. His curfew is dusk, which is when we round him up and lock the cat doors. Beautiful early autumn images. I hope you’re staying warm and dry during this weird rain and wind event! So the bamboo… First, tie the bamboo together to get it out of your way. With an old pruning saw, cut the soil & roots around the opening, creating a cylinder of soil and roots the size of the opening. This may be difficult because the pot looks to be a little deeper than a typical pruning saw blade. Don’t forget to wear gloves. After some work, grunting and maybe a little swearing, you should be able to free the plant from the pot. You may have to cut away some of the outer parts of the top growth as well but these might make new plants to give to unsuspecting friends. I love pots that come in at the top so now I either plant things that will stay permanently in them or plant in cylindrical pots that will fit down inside the ornamental pot and mulch to hide the plastic pot. Thanks so much Peter for the tips on extricating this bamboo — and the idea of nesting cylindrical plastic pots inside the shapely architectural beauties! You should be included on KUOW’s gardening panel! I called them last year with the same question. Your mention of an old pruning saw really resonates. Somewhere in my garden tool shed is an old saw ( at least 2/12 feet long including the wooden handle) that I inherited from my mother-in-law. It’s perfect for the job. I’m sure the effort will be worth the work: I’m excited about all the little divisions and/or starts from this spreader that will result. You will have one (or two) for sure. Were you able to extract the bamboo and save the pot? This is my favorite type of bamboo, I am hoping to find a large patch someday. I’ve been procrastinating. I’m sorry to say I haven’t extricated the bamboo yet. That said, your question has spurred me forward, especially since the bamboo is longing to be freed. It’s not doing that well, perhaps it’s stunted. It must be quite the root mass. As soon as it warms up a bit, I’m going to hack it into pieces and pot them all up and hope for the best. Do you live in the Seattle area? I can share a few starts if all goes well.